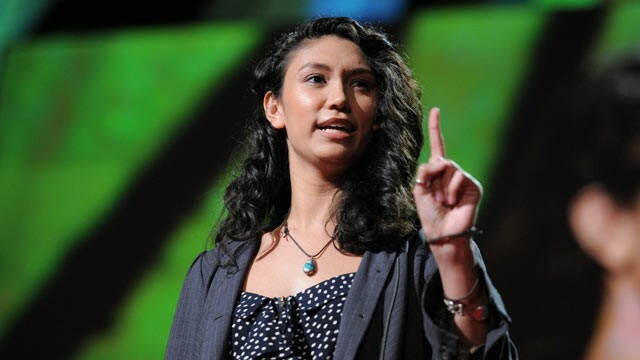 Sarah Kay is an American poet, she performs spoken word poetry and is a key part of Project V.O.I.C.E., this group was founded to inspire and educate by using spoken word as a tool. Below is a link to Sarah’s TED Talk from 3rd March 2011. Sarah performed at the TED conference in California, her talk was part of a series called “Beauty, Imagination, Enchantment.” Sarah spoke about her background and upbringing, as well as performing her poems “B” and “Hiroshima”. Sarah has also published poems in magazines and last year she published “B”, a short hardback book containing her poem and featuring illustrations by her lifelong friend Sophia Janowitz. Gallery | This entry was posted in Design / Arts / Crafts, Stuff and tagged If I should have a daughter, Poet, Poetry, Project V.O.I.C.E, Project VOICE, Sarah Kay, Spoken Word, TED, TED Talk, VOICE. Bookmark the permalink.